What Is Indie Lee Facial Serum? Indie Lee Facial serum, US $130 f0r a 1 fl. oz. vial, is a concentrated anti-aging serum solution infused with the stem cells of a rare Swiss apple to help your skin better cope with the onset of visible signs of skin aging as a result of senescence and damage caused by stress and environmental stressors. This product is brought to you by Indie Lee, the namesake of a survivor who overcame brain tumor. Since coming out of illness in 2009, the founder made it her personal mission to concoct non-toxic skin care products to provide better alternatives that are deliberately made to care for skin, health and environment. Indie Lee Facial Serum — Does It Really Work? Revive your skin from the damage and dullness caused by day-to-day exposure to environmental toxins, including pollution. Restore your skin’s youthful health by replenishing moisture and nutrients your skin needs to boost its natural mechanisms for repair and renewal. Provide your skin with better protection from environmental stressors to prevent damage and aging. With regular product application, your skin’s healthy status and youthful appearance is restored, fading wrinkles and other signs of skin aging. What Are The Ingredients In Indie Lee Facial Serum? Chondrus Crispus Extract: A seaweed extract loaded with vitamins and minerals that replenishes your skin’s nutrient requirements, boosts its moisture content, and generally uplifts your skin’s health so that beautiful, more youthful skin can show through. Hyaluronic Acid: This ingredient keeps collagen synthesis up, as well as retaining skin moisture, contributing to the anti-aging benefits to the skin. Namely, some people complain that their skin dries out after using hyaluronic acid. Malus Domestica Fruit Cell Culture: Derived from a rare Swiss apple, this has been clinically shown to have age-defying properties, including decreasing the depth of wrinkles and correcting photodamaged skin. Lecithin: Significantly restores your skin’s moisture content with its powerful emollient properties which results to a smoother skin texture and skin that is more supple to touch. 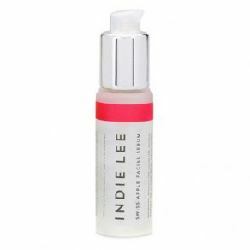 Indie Lee Facial Serum is recommended for application up to twice daily for best results. Apply a generous amount over freshly and thoroughly cleansed and toned skin, on its own or, underneath a moisturizer. In the morning, always layer with sunscreen. Allow the product to completely blend into your skin before layering with makeup and other products in your routine. Indie Lee Facial Serum is made with naturally derived extracts as its primary ingredients to help your skin defy aging. This product uses non-t0xic ingredients. This product helps even out skin tone. Although Many user reviews say it isn’t very effective. This product is significantly more expensive than most other antioxidant serums available in the market that commit to similar results. Indie Lee Facial Serum reviews indicate mixed reactions and results, some saying it improved their skin while others claiming that product use did not result to any visible improvements. This product may not be suitable for all skin types. This product contains Hyaluronic Acid which may cause skin irritation. Does Indie Lee Facial Serum Have Any Side Effects? Based on the ingredients and reviews, the only side effects that may be experienced when using Indie Lee Facial Serum are skin irritation and allergic reactions, depending on your skin’s tolerance and history of allergies. It isn’t hard for Indie Lee Facial Serum to appear as the better alternative to revive your skin’s health with its non-toxic formulation. However, the skyrocketing price tag may just be too much for what’s really inside the bottle. There also has yet to be an overwhelming evidence to show that plant stem cells, when applied topically, can help alleviate and reverse wrinkles and other signs of skin aging. Airelle Age Defying Facial Serum Review: Ingredients, Side Effects, Detailed Reviews And More.